Until last Monday, when engineers began hoisting its two-thousand-ton cutterhead to the surface, Bertha, the world’s largest tunnel-boring machine, was stuck a hundred and twenty feet below the streets of Seattle, too damaged to move far forward and incapable of going in reverse. The machine, which weighs some seven thousand tons and is about as long as a football field, is the centerpiece of a two-billion-dollar project to build a stretch of underground highway two miles long, two lanes wide, and two levels high. 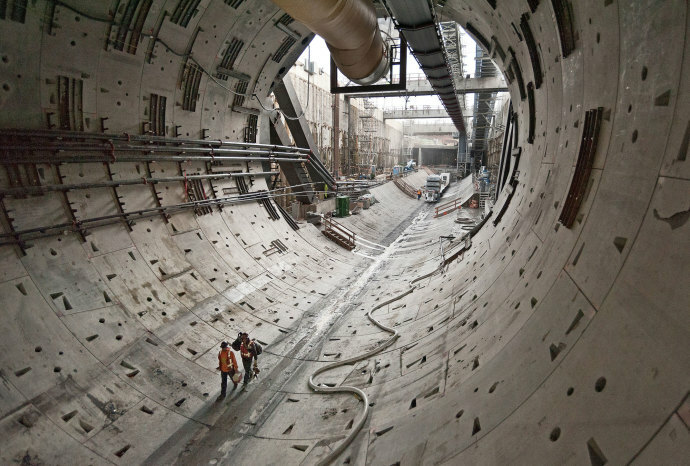 But, in December of 2013, after only four months and a thousand feet of digging, Bertha overheated and was shut down. Attempts to fix it set off a cascade of other construction problems, helping to secure the tunnel’s reputation as one of the biggest megaproject fiascoes in history. The extravagant scale of the disarray in Seattle may seem exceptional, but among megaprojects—commonly understood to be projects that cost at least a billion dollars—the size of the undertaking is nothing special. According to Bent Flyvbjerg, a management professor at the University of Oxford’s Saïd Business School, megaprojects have come to constitute eight per cent of global gross domestic product. China is most responsible for this explosion—according to the scientist Vaclav Smil, the country used more cement between 2011 and 2013 than the United States did during the entire twentieth century—but many nations have contributed. The projects include not only tunnels, bridges, dams, and highways but also airports, hospitals, skyscrapers, cruise ships, wind farms, offshore oil and gas rigs, aluminum smelters, communications systems, Olympic Games, aerospace missions, particle accelerators, the Affordable Care Act Web site, entire cities—the list goes on and on. Some of these projects are properly conceived and implemented—the nearly completed London Crossrail, which includes twenty-six miles of tunnels beneath London, will probably qualify—but they are the exception, according to Flyvbjerg. More common are worthy but poorly executed megaprojects, or megaprojects that never should have been attempted in the first place. The “iron law of megaprojects,” he wrote in a 2014 paper in Project Management Journal, is that they are “over budget, over time, over and over again.” Nine out of ten megaprojects experience cost overruns, and most take much longer to build than expected. What results, Flyvbjerg says, is the “survival of the un-fittest”: the least deserving projects get built precisely because their cost-benefit estimates are so misleadingly optimistic. Superlatives are at the heart of our infatuation with megaprojects—the irresistible attraction of building the world’s tallest building or biggest cruise ship. And, as Flyvbjerg noted in his 2014 paper, megaprojects have broad appeal: engineers are delighted to develop new technology, politicians revel in the visibility they reap from building monuments to themselves, and everyone else—developers, bankers, lawyers, consultants, landowners, contractors, and construction workers—is happy to claim a share. If a project is an aesthetic success—like, say, the Sydney Opera House is (despite its fourteen-hundred-per-cent cost overrun, which derailed the career of its architect, Jørn Utzon)—the public may embrace it as an icon. The Seattle project neatly corroborates Flyvbjerg’s findings. It is now due to be completed at the end of 2017, two years behind schedule, and Bertha’s delays have only added to the steadily mounting and still uncalculated costs. When the machine’s foundering led to calls for construction to be abandoned, officials summarily dismissed them. “There’s no turning back,” Tim Burgess, the president of the Seattle City Council, said in December, 2014. Instead, workers spent more than a year digging an eighty-three-foot-wide shaft down to it. Because Seattle’s water table is high, millions of gallons of water had to be pumped out from the site as the shaft was formed. The pumping, in turn, may have caused the surrounding land, in one of the city’s prime tourist areas, to settle by an inch or more; occupants of nearby buildings complain that cracks have begun appearing in their walls. Last week, a massive crane, built specifically for the job, completed the two-week-long task of lifting to the surface key parts of the boring machine. When repairs are complete—not before the end of August “in the best of circumstances,” according to the project’s contractor, Seattle Tunnel Partners—the parts will be lowered back into the tunnel and reassembled. In the meantime, water will continue to be pumped around the shaft, possibly causing more subsidence. Buildings sit above most of the remaining tunnel route, so if Bertha fails again workers won’t be able to dig a new shaft to reach it. The only alternative—performing repairs from within the tunnel and through the machine’s long tail—would require even longer delays. Bertha’s problems are not a complete surprise. In 2010, The Stranger, a Seattle alternative weekly, published an article called “What Could Possibly Go Wrong,” answering the question this way: “The tunnel-boring machine gets stuck.” The machine works best when it digs into a uniform substance, but the earth around the tunnel, known as fill, is highly variable, with complex combinations of soil types, pieces of metal and concrete, and possibly even boulders and car bodies. An engineering consultant hired by Mike McGinn, Seattle’s mayor at the time and an opponent of the tunnel, warned that the site’s poor soil conditions and high water table posed unprecedented risks. But a consultant hired by the city council, which favored the tunnel, concluded that the risks were manageable. Unfortunately, false cost-benefit estimates have a way of elevating big projects over more cost-efficient, less environmentally disruptive ones. At Oxford, Flyvbjerg directs a program that teaches megaproject managers how to make cost-benefit forecasts more accurate, but accurate budgets alone won’t clarify which projects merit approval. The decision is often as much about social, aesthetic, and even patriotic concerns as about economic ones; the last three skyscrapers to have claimed the title of “world’s tallest,” in Dubai, Taipei, and Kuala Lumpur, were intended, at least in part, to draw attention to their countries’ modernity. The projects suggest the allure of the grand and grandiose, as if their true function were to deliver reassurance that the human arc is upward. The trouble with megaprojects is that their glitter can conceal the benefits of less imposing alternatives, for big isn’t necessarily best. In 2009, McGinn, a Sierra Club activist with little political experience and modest financial backing, was elected mayor of Seattle. He had campaigned against the tunnel, arguing for a cheaper​ option: a plan, already found feasible by an advisory council of city and state stakeholders, to develop the city’s light rail, expand bus service, and repair and reorganize streets. Pro-tunnel forces—including Washington State’s Democratic Governor, Christine Gregoire; Greg Nickels, McGinn’s predecessor as mayor; construction unions; and the Greater Seattle Chamber of Commerce—painted McGinn as an obstructionist, eventually winning unanimous approval from the City Council for the tunnel. In 2013, McGinn lost his bid for reëlection, but his opposition looks more prescient with each new crack that appears in the buildings above Bertha.